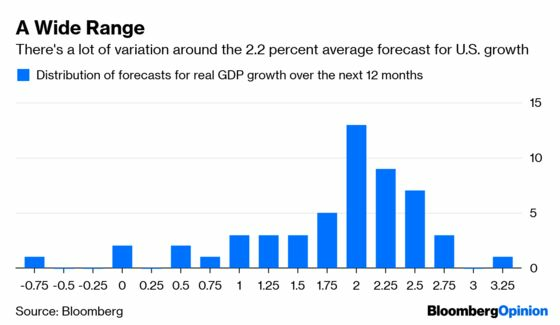 (Bloomberg Opinion) -- Will the U.S. dip into recession sometime in the coming year? Economists increasingly disagree on what will happen — and that in itself may be an ominous sign. Variation can matter. 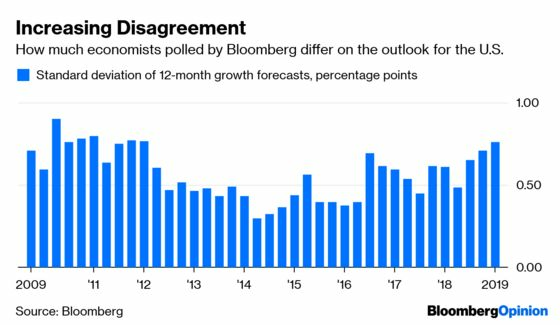 Back in 2007, when I was managing a similar survey at the Wall Street Journal, I noticed that although economists weren’t very good at predicting recessions, they did tend to disagree more when one was imminent. That’s what happened before the downturns of 1990 and 2001, and what ultimately happened before 2008. It’s not a perfect indicator, and can spike without foreshadowing anything, but it’s worth watching. The level of disagreement makes sense: With variables such as Donald Trump’s trade policy, Brexit, China’s growth prospects, risky corporate debt and an inverted yield curve in play, it’s particularly hard to guess what might happen. Whatever makes economists uncertain might also be what tips the economy into a slump. Mark Whitehouse writes editorials on global economics and finance for Bloomberg Opinion. He covered economics for the Wall Street Journal and served as deputy bureau chief in London. He was founding managing editor of Vedomosti, a Russian-language business daily.